Beware! A grotesque mutation is affecting Asians moving to Hollywood. Black hair miraculously turns fair, dark eyes lighten and Asian skin turns pink. This horrendous disease was first noticed in 1956, when my father watched a movie called The Conqueror, about Mongol warlord Genghis Khan. It revealed that on his way to the screen Mr Khan acquired white skin and an American accent. “Yah didn't suckle me ta be slain by Tarters, mah muth-err,” Genghis (played by John Wayne) said to his parent. This scary ailment struck again in 1961, when Mr Yunioshi, a Japanese character in Breakfast at Tiffany’s, turned completely Caucasian on set. The props department had to disguise the actor (Mickey Rooney) with thick glasses and fake buck teeth to help him revert to the Asianness the character demanded. The most shocking case of trans-racial mutation occurred in The Mighty Gorga, a 1969 movie in which American explorers go to Africa where they discover a tribe of, er, Indians. (Apparently the producers of the film never realized that Indians live in India and Africans live in Africa.) But when the film was screened, every single one of the Indian/ Africans described in the trailer turned out to be Caucasians. In the 1970s, I was interested to hear about the development of a TV series about a wandering Shaolin monk. But by the time Kung Fu screened, he had become Caucasian. The series was followed by Kung Fu: The Legend Continues, in which the monk (David Carradine) discovers he has a son, Peter. Peter (Chris Potter) is clearly Caucasian, so I supposed the mutation must be hereditary. Further evidence for this comes from HBO’s Marco Polo movie featuring Kublai Khan. Like his grandfather Genghis Khan, young Kublai (Brian Dennehy) became completely white on his way to the screen. On stage, I saw the Cameron Mackintosh production of Miss Saigon, in which the Eurasian character looked suspiciously like British actor Jonathan Pryce with tape over his eyelids. Looking ahead, this racial morphing is escalating nightmarishly. In the Hollywood pipeline for 2008 release is Dragonball Z. In the original story, the main character Goku has alien blood but in terms of looks, is unmistakably a Japanese anime boy. But sneak previews of the big screen version show Goku as a cute all-American mop-headed Caucasian (Justin Chatwin). In May this year, Hollywood launches Speed Racer, a movie adaption of the classic 1960s Japanese tale about boy driver Go Mifune. Lo and behold, fans will find that Go Mifune will be played by a pretty white boy (Emile Hirsch). 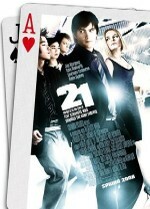 Opening on cinema screens worldwide over the next few weeks is 21, the true story of a group of Asian-Americans (some students and their teacher) who used their math-geek ability to legally win millions of US dollars at casinos. But when their story hits the screen, we find the main characters have mysteriously become white. Student leader Jeff Ma is played by Jim Sturgess and teacher John Chang by Kevin Spacey. This one dismayed me. After all, we Asians spent decades honing our reputations as bookish math geeks! Now I’m not saying that all Asian characters become Caucasians when they reach the big screen. Consider the 1990s remake of The Jungle Book. It started Jason Scott Lee as Mowgli. Yes, finally, an actor of Chinese ethnicity gets a starring role—as Mowgli, an Indian. Survived your latest business trip to un-urbanized parts of Asia? Congratulations. It may be luck, or you may have been lucky enough to have absorbed the information you need to know to keep alive. Here are the 20 Unwritten Rules of the Road for going off the beaten track in Asia (with thanks to Nigel Dahl, Sahir Siddiqui, Greg Botts and others). Rule 2: Except for the golden rule which is: Cows get priority. Rule 3: All traffic drives on the left. Rule 4: Except for traffic which drives on the right. Rule 5: And the traffic which drives in the middle. Rule 6: Instead of seat belts, wear a garland of flowers or a feng shui amulet, which offer better protection. Rule 7: If you are driving a truck, paint “No Kiss” or “Horn Please” on the back. Rule 8: Might is right. Rule 9: Instead of driving in a manner that ensures you arrive at your destination alive, set up a small shrine (Ganesh, Kuan Yin, Buddha, the Virgin Mary, or all four). This ensures the worst thing that can happen to you is that you get to heaven faster. Rule 10: You should only ever overtake on the right. Or the left. Or over. Or under. Rule 11: Multi-tasking while driving is compulsory. Beginners may wish to drive, chew betel nut and talk on a mobile phone, while advanced drivers should do all three plus enjoy a three-course meal, drink a bottle of locally brewed wine, sing a karaoke song and watch television. Rule 12: Signaling before you turn is considered bad form. Surprises are more fun. Rule 13: When driving at night, headlights should be kept (a) at full beam to blind oncoming drivers, or (b) switched off (see reference to “surprises” in Rule 12). Rule 14: Checking to see if there is any oncoming traffic before pulling out to overtake is considered the behavior of a “wuss”. Rule 15: You’d be surprised how many vehicles can fit abreast on a two-lane highway. Rule 16: If the road is blocked, the hard shoulder may be used as a road. Rule 17: If the road and the hard shoulder are blocked, the pavement may be used as a road. Rule 18: Do not run over pedestrians, cyclists or scooter-riders, unless necessary. Rule 19: But remember, there are no rules. Rule 20: Except the one about the cows. Reader Vince A. says that drivers in Manila do stop when they see red traffic lights. “Unfortunately, they’re looking at the traffic light at the next junction rather than the one they're approaching,” he said. Prize for the dumbest traffic campaign goes to the Hong Kong Government, for: “Hong Kong’s Aim: Zero Traffic Accidents.” In other words, they have blown taxpayers’ money on a campaign that is (a) impossible to achieve and (b) guaranteed to fail in the first hour. SET ASIDE any notion that Asians have no sense of humour. We have a sharp eye for the absurd. “Life being what it is in Asia, we have the choice of laughing or crying, so we may as well laugh,” said reader Ameena Chowdhury. A correspondent named Steven Yang agreed that many jokes tended to be “imported and not relevant to the local culture”, so it was worthwhile for us to gather work which “stands uniquely against this trend”. So here’s some humour sent in by readers. A Chinese girl, newly arrived at Harvard, has a long chat with the librarian about a book she is seeking. Finally he says, "I'll give you a ring tomorrow." Five reasons why there won’t be a South Asian in the US White House any time soon. 5. White House not big enough for in-laws. 4. Western dignitaries intimidated by eating with fingers at state dinners. 3. Agarbattis (incense sticks) will set off smoke alarms. 2. Visitors such as Queen Elizabeth won’t like having to take off shoes at the door. 1. Aides will dislike being addressed as “Peon” and being made to live in huts in the garden. Barack Obama goes to China to see how the Olympic preparations are coming along. “How come you guys win all the medals?” he asks. “Wot? I dunno,” says Beckham. “It’s Asian philosophical training. Think about it,” says Obama. “What is it?” Obama asks. “It’s Tiger Woods,” says Beckham. Asian authors are watching the progress of the wolf with bated breath. Lu Jiamin’s Wolf Totem, a bestseller in China, is now being launched in English. Will it be a notable piece of Asian fiction that turns into a Western bestseller as well? An inability to speak Asian languages can be helpful, reader Mick Wilkinson discovered. Mick, who lives in Australia, has an unpleasant memory of one night in Hong Kong when he had to rush his baby son to hospital and spend the night propped up in a chair. As dawn broke, he went to get his car—only to find that a yellow metal wheel clamp had been padlocked to its wheel. He’d parked next to a no-parking sign which was written in Chinese only. Stung by the unfairness of the situation, he bought a pair of metal cutters from a nearby hardware store and snipped the padlock off. Then he spent a long minute thinking about whether to race off in his car and take the wheel clamp with him, and thus never have to worry about parking problems again. But in the end, he did the honourable thing, and purchased a shiny new padlock, leaving it on top of the yellow clamp. A few months later, he received an envelope from the hospital’s parking service. It contained a photograph of his clamped car and a hefty bill for the equivalent of US$200 to cover a US$50 fine plus “administrative expenses”. “Fair enough, staples don’t come cheap,” he joked to his wife. Then he had an idea. He sat down and wrote a letter explaining that he was a Westerner and thus suffered from profound stupidity at not being able to master Chinese characters. “To my surprise, a week later I received a personal letter from the manager, cancelling my well-deserved debt in full,” he said. So let’s pass the question over to young female readers. Why do today’s Asian women prefer wimpy, metrosexual guys to the macho members of the previous generation? US congressman Phil Gingrey recently said he was unhappy that people “with Asian and Indian names” dominated the list of top scorers in tests in his district. He asked Bill Gates, who has been lobbying for more work visas to be given to skilled Asians, whether "youngsters who look like me" would find the influx of foreign workers a deterrent to choosing technology careers. Phil, baby, this is the year 2008 and you are on a globalized planet. There are many smart people on this planet who have Asian names and don’t look like you, and some are even American citizens. Whoa, is he in for a shock. A unique brand of pan-Asian English really exists, readers reckon. Its vocabulary comes from English, but grammar and word-order comes from Chinese, according to an academic. Singapore already has lots of works in Asian English, but examples can also be found in Malaysia and Indonesia. This discussion reminded me of a one-act play called Don’t Stupid-Lah, Brudder, which was written entirely in Englasian by a group of contributors to the Far Eastern Economic Review. In it, you can “hear” three variations of Englasian: East Asian, South Asian and Australian. Plot: Mal, a Malaysian investor, is having kopi (coffee) with an Indian accountant named Indra. They are in a hotel in Jakarta waiting for Oz, an Australian entrepreneur, with whom they are setting up a business. Mal: Plan latest where got? Indra: Not having. Maybe Oz has? Mal: He here already, is it? Indra: Yesterday already he checked in. Mal: [Pointing to Indra’s bag] Inside is what? Indra: Contact list and other sundry items. Mal: Contack how many? Hundred-over? Mal: Waah. Damn good. Oz is where? Mat salleh sleep too much always. Make me frus only. Oz: Greetings! Hi, chooks. Bit late—apologies. Mal: No nid-lah. Sit-sit, don’t shy. Oz: You Indra? Pleaseta meetcha. Indra: We met before one time, no? At the party to felicitate my cousin-brother, a revered Sydneysider? Mal: Waah, stylo-milo only-lah today you. Oz: Huh? Oh. My clothes were a bit daggy after the flight so I got a new shirt and some daks. Mal: Nice, man. Now start already. Indra: You are bringing business plan? Oz: Godit right here in me bag. Indra: Put the papers out. Projections, case studies, like that, also need. Mal: Cover letters ready, is it? Oz: No worries. Needs number crunching but. Mal: Total down is what? Indra: For one lakh output. Mal: How can? No need so much. Indra: Ya, nine crore-over maybe. You don’t know, goondu. Mal: Why you say me like that? Oz: Don’t do yer lolly. Let’s have a squiz. Oz: What does aiyeeah mean, anyway? Mal: No word in English. Only Indian. Oz: What is ‘Aiyeeah’ in Indian? Mal: Let’s go to my room, can crunch numbers on my laptop. Indra: First must do the needful. ASIANS HAVE NO sense of humour. Their idea of comedy is slapstick. Irony doesn’t exist in Asian discourse. There are no comedians in Asia. That’s a list of conventional beliefs about humour in Asia. I don’t think any of them are true. But I don’t blame anyone for thinking these things. The west is overflowing with stand-up comics and comedy movies and witty cartoons. But comedy—well, intentional comedy—is harder to find on the eastern side of the planet. You need to know where to look. There’s lots of wit in the Philippines. There, you’ll find a bakery called Bread Pitt; a pipe-laying firm called Christopher Plumbing; a boutique called The Way We Wear; a burger shop called Mang Donald’s; a hairdresser called Felix the Cut; a butcher called Meating Place; and so on. Other parts of Asia also generate jokes. You Know You Are Asian If: (a) Your dad is an engineer or a doctor; (b) Everyone assumes you’re good at math; (c) You have a 25-kilo sack of rice in your pantry; (d) You have rocks, sticks, leaves and mysterious strange-smelling substances in your medicine cabinet. (e) You refer to all adults as Auntie and Uncle. Manager: Raju! You was discharged from hospital yesterday only. Why you come office today itself? 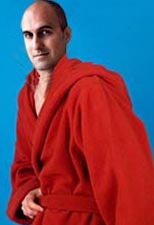 Raju: Doctor told me take rest for a month. That’s why I come to office! Why is Asian humour tough to find? The media in Asia tends to be run by government officials and business people looking after their own interests (sorry, is that tautology?). Individuals like that just ain’t funny. China once put out a government-approved pop song called When I Grow Up I Want to Be a Peasant. Without a trace of irony. So instead, look to the Internet, student publications, theatre groups and so on: that’s where the humour’s hiding. The fact that you are reading this column makes you part of a large group of people in Asia who like a laugh—so we are perfectly placed to “prove” Asia has a sense of humour. If you know any Asian jokes, send them in (no, don’t post Joseph Estrada to me). An Asian man goes into a night market food-stall and orders three rice dinners. He eats all three by himself. “Hungry?” asks the food stall man. Every day the diner comes to the food stall. And every day he eats three rice dinners. This goes on for more than a year. And then one day he comes into the restaurant looking very sad. He orders only two rice dinners. The food stall boss approaches with his head bowed. “I would like to offer my condolences on the sad passing of one of your brothers,” he says. SIR ARTHUR was lost in his own world, as usual. The last time I saw Arthur C. Clarke, the visionary author of 2001: A Space Odyssey, his hearing had gone. This columnist was interviewing him on stage in Sri Lanka last year. I shrieked each question into his left ear until I was red-faced. But he misheard everything I said. The result was that (a) the audience got a good laugh at the total disconnect between what I asked and what he replied, and (b) Arthur ended up ignoring me and talking about whatever came into his head, which was a darn sight more interesting for all concerned. He first approached my family in 1956, when he was diving addict hanging out on Unawatuna beach on the south coast of Ceylon. He wanted my father, a newspaperman, to print something he had written. The stuff was bizarre, mind-boggling and unrealistic, but kind of fun – so my Dad agreed. Good call. To be brutally honest, Arthur wrote some of the most forgettable human characters in literary history, but his non-human ones (such as HAL 9000 the computer) were absolutely riveting. Our families became friends. His house in Colombo was famous for three reasons. It had a satellite dish on top, long before anyone knew what a large metal dinner plate on one’s roof could do. It had its own elevator—an unheard-of luxury in a private home. And there was his souvenir-filled study, which he called The Ego Chamber. “This is a bit of a spaceship, and here’s a chunk of the moon,” he would say, holding up items from his shelf. “Yeah, right,” we said, not knowing whether we dare believe him. Clarke became totally Asian. He wore a sarong on his lower half and a Nehru jacket on his top half. His friends were all locals. He lived on curry. He took revenge on people who didn’t take him seriously. He revealed to everyone that the short story that became 2001: A Space Odyssey was written for the BBC, but was rejected. And then there was his dig at a lawyer who gave him bad advice. Arthur famously came up with the concept of orbiting satellites. A lawyer friend thought the whole idea was too far-fetched and told him not to patent it. Arthur put this anecdote into an essay entitled How I Lost a Billion Dollars in My Spare Time. 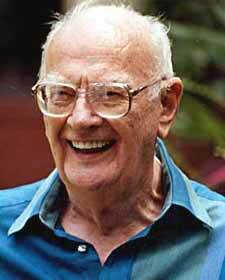 At his birth anniversary party in December, Arthur C. Clarke told folk that it wasn’t his birthday. “It’s my 90th orbit of the sun,” he explained. Goodbye, Arthur. We’ll miss you, but your tales will orbit forever. TOP BRITISH novelist Hari Kunzru is going to have to put his pants back on. And he’s feeling a little nervous about it. The London-based author, darling of the critics, is to move to New York later this year. But instead of working from home, he will be based at the New York Public Library. “That means I have to actually put my clothes on,” he told me, looking rather alarmed. At the moment, he can shuffle straight from his bed to his computer without having to do anything as arduous as getting washed and dressed. “Why don’t you just treat it as a home-from-home and work in your pajamas anyway?” I suggested. His eyes brightened. “Not a bad idea, I could shuffle along the corridors in my robe with a mug of coffee and behave as if I was at home,” he said, pretending to yawn and scratch his crotch. "I could spread my stuff all over the place and go to sleep on the sofa." I told him that it would all add to the legend: writers are expected to be rather eccentric, after all. Next: Top British Novelist arrested for indecent exposure. ANOSH IRANI, the young Mumbai-born author now living in Canada, has just sold a new book. The work is a “multi-generational saga” about a family which migrated from Iran to Bombay – so it sounds a lot like the story of his life, but I assume it is fictionalized to a greater or lesser extent. It will come out in spring of 2009. PENGUIN CHINA is looking at commissioning books instead of just buying them, I heard while in Shanghai over the weekend. And they’re happy to look at folk who write in English as well as those who work in Chinese. Interesting, huh? DA CHEN, the Fujianese immigrant who became a law professor and successful novelist in the United States has a new book finished. It’s called The Sword and rights have been snapped up by Scholastic. THE VIETNAM Culture and Information Publishing House is buying works in English, to translate into Vietnamese, I hear. Despite the name of the organization, it is not a propaganda house, but actually tries to operate as a popular fiction publisher. They’ve just bought Storm Front, a sci-fi thriller by Jim Butcher. ONE OF THE MORE worrying book titles I have heard on the “manuscripts-just-sold” list this week is a book called “Men Are Wonderful” by Noelle Nelson. It is a work designed to help women realize that their male spouses have good qualities. Surely this should be self-evident? THERE’S SOMETHING BIZARRE about road travel in Asia. If you are in a country where people drive in a careful, orderly way, like Japan, cars have a special seatbelt for every bodily protuberance and there’s a death penalty for not wearing the lot. But if you are in a country where people drive like suicidal banshees with their tails on fire (like the countries of Indo-China), many cars have no seatbelts and some don’t even have doors. Life-saving devices are only provided when you don’t need them. This column is being written while bouncing in the back of a taxi in China, a country with a very Asian code of driving. In this region, traffic priority is predicated strictly on bulk. Bicycles give way to scooters which give way to motorcycles which give way to cars which give way to trucks which give way to tanks which give way to presidential vehicular entourages which give way to troop carriers from the latest armed coup. Pedestrians give way to everybody, all the time. In Asia, traffic lights have the same colours as elsewhere on the planet, but the meanings differ. Green means go. Amber means go faster. Red means put your foot flat on the floor and go through at twice the speed of light (because then no one can see you). Yet each major city has its characteristic styles of driving. So here, with help from readers, is The Guide to International Driving Styles. Jakarta: Car window open, one arm out, Kretek cigarette between fingers. Kuala Lumpur: Car window open, one arm out, other hand holding plastic bag of tea or kopi. Dhaka: Car window open, driver’s head sticking out shouting at people to get out of the way. Singapore: Car window shut, air-con on, driver thumping steering wheel in frustration that traffic jam won’t let him get his Ferrari into second gear. Hong Kong: Car windows shut, one hand on wheel, other hand texting broker to buy securitized hedge fund swap-options. Manila: Car window open, one arm out, in-car karaoke playing at full volume, driver singing Feelings. Beijing: Car windows closed, driver completely invisible in black shades behind black glass in black car speeding through red lights with no number plate. Sydney: Roof down, one arm out, other hand resting lovingly on six-pack of Foster’s on passenger seat. Paris: Car window open, Gauloise-bearing hand sticking out, other hand resting lovingly on knee of passenger. New York: Car window open, one arm out, middle finger raised. Colombo : Car window open, half of driver sticking out of the car to make room for nine family members crammed into it. Taipei: Car window open, hands inside vehicle, eyes and tongue of driver extending out of side window to leer at betel nut girls. Los Angeles: Driver hunched low beneath baseball cap and shades, back window open, passengers riding shotgun. Hanoi: Car window open, one arm out, other arm holding plastic gallon jug of homebrew. Macau: Car window shut, driver in a trance as he tries to memorize blackjack card patterns. I’d better stop writing now. The traffic lights have turned red and my driver is about to go into warp speed. MONDAY: It was the worst possible start to the week. Someone tampered with my morning fix. At the coffee-shop my barista/ pusher shouted out something I didn’t catch and placed a paper bucket on the bar. A woman approached, saying: “Oops, sorry—that’s mine. I picked up the wrong one.” She guiltily puts the one she’s holding back. I pick up the drink she has returned and take it to the office. I take a sip and spit all over my keyboard. In the 30 seconds she had my drink, she’d added cinnamon, a slice of ginger and something which smells suspiciously like garlic. “But it isn’t,” I object. He waves away this inconvenient obstacle and me. TUESDAY: Last night I sent out a request to regular contacts asking for examples of Asian media freedom. This morning my inbox contains a report from a Manila newspaper about an assassinated politician. The victim “was widely believed to have been corrupt, so perhaps it’s not such a bad thing”, says a quote from a policeman. Can’t help thinking about the woman in the coffee shop who likes ginger and garlic in her coffee. Talk about tastelessness. WEDNESDAY: I receive a news clipping from a reader in Indonesia. After a hotel guest committed suicide, a hotel public relations officer said: “Please tell the public that if they have to die, they should not do it here. They can use the river for example.” Now that’s pragmatism. Decide to slip a bit of ginger into my coffee just to see what it is like. Surprisingly nice. SATURDAY: I see the woman in the coffee shop. “Why do you put garlic and ginger in your coffee?” I ask. IN A SPEECH which mentioned Einstein (whose birthday is today), an Asian leader used the phrase “the good old days” about the region’s past. Good? Who is he kidding? I reckon it would be more accurate to use terms such as “interesting”, “exciting”, “hair-raising” or perhaps “trouser-staining”. Your columnist’s earliest memories of life in Asia include wars, coups, cross-border escapes, weapon-smuggling, polygamy, visits from strange gurus and the occasional assassination. And that was just in my house. In other words, I had a fairly normal Asian upbringing for a person of my age. This is not a joke. Ask adults in Asia to tell you their life stories, and phrases such as “then we escaped as refugees” or “then Father married Third Wife” or “then we became followers of the divine potato” are pretty much the norm. My family was nomadic, and unluckily tended to pick places to live which were highly unstable. But they were also very pretty (as were the three wives my father had). Anyway, the next time you feel that modern Asians have too much pressure in their lives, here are 16 reasons to be thankful that life in Asia today is not like it was a few decades ago. 3. Blood donating was seen as a legitimate way to earn a living. 6. A floppy disk was a type of back injury. 7. If you wanted to get money out of a bank, you had to take a day off work. 10. Europeans were hated and despised, but if one invited you to tea, this was considered a very great honour indeed. 12. The phrase “Big Mac” referred to Scottish tourists. 14. At government offices, you had to pay a special fee to do anything, including paying special fees. 15. The Queen of England was generally assumed to be monarch of the whole world, and I still subconsciously think that. 16. Each city had only had one TV station and a couple of cinemas but we still had a better choice of things to watch than you do now with your 500 channels. In some places at least, life has changed, and for many reasons I am grateful for that. But now you know why many Asian men have a deep-rooted fear of hairdressers. TODAY IS THE ANNIVERSARY of the discovery of the planet Uranus. I’ll never forget the time I was asked in front of a school audience to name the seventh planet, and I pronounced it in a way that give rise to much sniggering among the schoolboys. Sadly, it was only much later that a reader informed me that the man who discovered Uranus actually wanted it to be called (this is not a joke) George, and insisted on using that name for it until his death. Someone else called it Uranus, giving generations of children a reason to smirk at their teachers. Talking of coined words, I really feel the English language just doesn’t have enough terms for all the new things it needs to describe these days. Abdomoan: The strange whining noises that come from your stomach when you’re doing the Atkins no-carbs diet. Abracandalabra: The technique of adding candlesticks to the table to make dinner magically romantic. Abriefiated: A description of your outfit after customs officers have made you strip to your briefs. Chickweed: Slim, pastel-colored cigarettes marketed for young women. Chimpansy: The male monkey who sits in the corner of the cage, refuses to wrestle for supremacy with the alpha male apes, and spends his time doing another chimp’s hair. Crushtasian: Getting into overcrowded public transport in Asia and feeling like a tinned prawn. D’ohrivative: Catchphrase or cartoon style copied from The Simpsons. Feedelity: Loyalty displayed by stray cats who assemble on the street corner at the same time every day to be fed by a mad cat lady. This term can also be used for teenagers who never emerge from their rooms except at feeding time. Feetal position: The way your suffering toes curl under when there’s snow on your shoes. Fidociary: A dog owner’s duty to set aside money to provide for his pet. G’iggello: Men you can hire to come to your house and laugh at your jokes. Hegemoney: Acting like you rule the world purely because you are a rich country. Macademia: The world of Scottish universities. Paradime: A so-called revolutionary concept that’s actually a worthless cliché. Protagony: The certainty that the main character in any story is going to suffer. Schwaltz: Sentimental orchestral theme that rises to a crescendo at the climax of movies for women. Sermoney: Cash raised by religious message designed to lay on the guilt. Shoestopper: Poorly chosen song that embarrasses the DJ as everyone flees the dance floor. Statistickle: Using a quick, un-sourced statistic to liven up a weak argument. Subpriminals: Villainous bankers who fouled up the US mortgage system. Untourage: Invisible, plain-clothes guards that surround really, really famous people. Verbaiting: When a woman and a man argue and the woman quotes word-for-word something she remembers the man said weeks, months or years ago. Wilocity: Speed at which hitherto unknown relatives appear when a rich person’s will is about to be read. Want to add to this list? Send me your suggestions and they’ll be included in a follow-up column. DID YOU SEE THAT brilliant Julia Roberts comedy movie The Sparrow Becomes the Empress? No? Never heard of it? Well, it may be a surprise to you, but you’ve probably seen it. Although it would likely have been under the dull title Pretty Woman. Today’s the 85th anniversary of the invention of the “talkie” film camera, so let’s talk movies. In Asia, we don’t just chuck Hollywood movies up there on our screens. No; we gloriously reinvent them with eye-catching new names. Come on, admit it: which is the most intriguing title? The English Patient? Or, the same movie as it was renamed in Hong Kong: Don’t Ask Who I Am? The Professional became This Hit Man Is Not As Cold As He Thought. And Bladerunner (which had nothing to do with blades or runners) became the intriguing Silver Wing Killer. In India, Hollywood movies are re-made from scratch, usually with a completely different title. The Indian equivalent of When Harry Met Sally appeared in 2004 under the name Hum Tum. When films move from India to the west, they don’t bother translating the titles at all. Dilwale Dulhania Le Jayenge sounds exotic, while the sentimental literal translation would have sent moviegoers fleeing: The Brave Heart Will Take the Bride. Yet it’s the English-to-Chinese renamings which are most entertaining, because you can clearly smell the desperation of distributors taking huge liberties to make a fast buck. The Cable Guy in Chinese became Trump Card Specialist and Liar Liar became Trump Card Big Liar. These make no sense until you realize that “Trump Card” is the East Asian moviegoers’ label for Jim Carrey, whose first successful movies in the region were the Ace Ventura series (“Ace” being translated as “Trump Card”). The logic veered off track when the first Austin Powers movie was released in East Asia as Trump Card Big Spy. It starred Mike Myers rather than Jim Carrey, but distributors apparently thought that the fact that it was a completely different human being was too subtle a difference to worry about. Why be fussy? Deranged white guys are deranged white guys. Movie distributors in East Asia reckon Western movie titles are not literal enough for Asian audiences. Deep Impact became Earth and Comet Collide, and Eyes Wide Shut became Eyes Wide Open. Anyway, next time you see Julia, tell her from me that I loved The Sparrow. And if you meet any Western film directors, I challenge them to market a romantic comedy movie under the name Hum Tum. Now that’s a perfectly reasonable thing to say. Except for one thing. This week is the fifth anniversary of SARS. In Singapore and Malaysia, people ate chilli to immunize themselves. In Indonesia, lizards were the remedy of choice. In South Asia, magic potions were prescribed. I still have my reporter’s notebook for 2003, so let me take you back to how it all started. February 11: “Six dead of mystery virus in Guangdong” a newspaper reported. February 12: The new killer virus was deadly but “not as serious as rumoured”, a Guangdong health official said. Only in China can virus be fatal but not serious. February 13: I visit my local supermarket and see people fighting to buy white vinegar, which is rumoured to cure the mystery virus. February 14: The Chinese press reveals there have been no deaths from the virus but several people have died trying to inhale white vinegar. March 10: At home, this reporter’s infant prodigy asks why a resident of our apartment block is now wearing a mask. “Don’t worry, it’s just our neighbourhood bank robber,” I quip. March 11: Widespread hysteria breaks out. Infant prodigy informs me that her school has been taken over entirely by bank robbers. March 20: The Hong Kong government orders all buses to jam windows open to improve ventilation and let germs out. April 1: Police arrest teenage prankster who puts out fake news alert saying “Hong Kong to be isolated from world”. April 2: World Health Organization orders that Hong Kong be isolated from the world. June 2: SARS disappears from Asia, having caused fewer deaths than normal flu viruses. Yes, it was a time of craziness. But looking back on it, there were things to smile about. Here are the Five Best Things About The Two Months When SARS Ruled Asia. 1. Most Asian government officials looked better with masks on. 2. For a while, people with bad breath only tainted themselves. 3. Elevator-users in Asia stopped jabbing the “door close” button because they didn’t want to touch anything. 4. Mothers-in-law all over the world cancelled plans to visit their offspring in Asia. 5. If you wanted more personal space, all you had to do was cough. I felt like a movie star whenever I travelled by air. People in first class got seats 24 inches wide. Business class passengers got seats 19 inches wide. In economy, I had the whole cabin and all the stewardesses to myself. And I wasn’t drinking white vinegar. Writer locked out of his own site! THIS COLUMN IS IN YOUR HANDS. Your Humble Narrator is on a book tour in China and all access to this column appears to have been blocked from where I am. I can’t read it, access it or add comments. The only thing I can do is send postings off and hope that they appear. Those of you who have added comments, please accept my apologies that I cannot respond. Life is funny—everyone has access to my website except me! I have this horrible feeling that when I finish this tour (Monday, March 17) I will get out of China, log on to this site and discover that it has been taken over by the Hello Kitty Society of Asia...! TOP US GOSSIP magazine The Hollywood Reporter is beefing up its operations in Asia, believing the region will become a major source of celebrity news. Er, we have news for them. It already is. In the Google charts for Asian countries, scandal-hit Chinese singer Edison Chen, for example, has been scoring way higher than scandal-hit American singer Britney Spears. So today, let’s have a celebrity news round-up. READER Sunita Chanu, an accountant, tells me her best friend is seeing two guys. “One is always taking about his metatarsals, while the other boasts about his megapixels,” she said. “She prefers the photographer, but how do we know she won’t end up like the girl from Twins?” she asked, referring to Gillian Chung, one of the girls in a recent scandal in which the bedroom photos of keen photographer Edison Chen ended up on the Internet. Ten Ways to Tell if the Guy You Are Dating Has Edison Chen Syndrome. 1. The first time he met you, he gazed at you through a frame he made with his thumbs and index fingers. 2. Then he held a light meter in front of your face. 4. The bulge in his pocket was a 600 millimetre zoom lens. 5. When he took you to the movies, he waited for the love scenes and made notes on all the camera angles. 7. You notice there is a make-up artist permanently on stand-by in the corridor outside his bedroom. 8. The only furniture in his bedroom is a bed and a tripod. 9. Then you notice the 17 computer-controlled spotlights on his ceiling. THE NEW Australian Prime Minister Kevin Rudd apologized for his country’s past injustices and human rights violations. However, he still hasn’t said anything about Kylie Minogue. Or she may have been referring to Edison Chen, of course. WARNING: DO NOT LAUGH at this column. Readers who do so are acting entirely at their own risk and we assume no responsibility for injuries caused by the reading thereof. I was intrigued. Thinking about this in a taxi on the way to see a comedian friend, I was reminded of The Funniest Joke in the World, a 1969 Monty Python sketch. This went as follows: During World War 2, a British comedy writer laughed himself to death after composing a joke so funny that anyone who heard it died laughing. So the British army decided to use it against the Nazis. It was so powerful that each word had to be translated by a different translator. (One translator who accidentally glimpsed a second word was hospitalized for weeks.) At the height of fighting in 1944, monolingual British soldiers leapt on to the battlefield and read the German translation of the joke, causing their enemies to drop dead on the spot. I am convinced this was based on fact. Idioms about humour all have violent connotations. “He laughed till his stomach hurt”. “She split her sides”. And the horrific: “They laughed their heads off”. From the back of the taxi, I phoned a doctor friend in Central. Can a person die laughing? “Can a man actually laugh his head off?” I asked. “Not at your column,” she said. I could hear him scratching his wallet as he pondered. “It would be cheaper to add a disclaimer to your column,” he advised. This solved a mystery that has puzzled me for months. Last year, I did a comic routine in front of an all-male audience of East Asians. They sat in stony silence. No one laughed. But afterwards, they raced up to me, slapped my back, told me they’d never heard anything funnier and made me promise to make a return visit. They must have been concentrating on keeping their heart rates at 85 per cent of maximum. WE ARE PLEASED to announce that thanks to the miracle of modern science, this column may expand your blood vessels! Legal disclaimer: Or it may not. Medical warning: If it does not, just deal with it. Do not cut this column out and insert it into a blood vessel, or any other part of your body. Hmm, let me start at the beginning. Somewhere in the sky between Indonesia and China, a flight attendant tapped my arm. “Didn’t you used to be Nury Vittachi?” she asked. She looked puzzled for a second and then laughed. 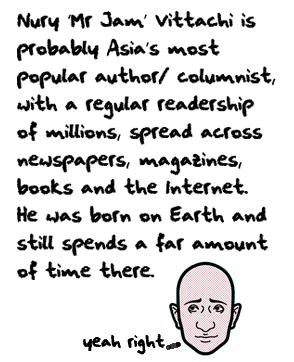 He was a standard modern Asian yuppie. Suit by Crocodile. Shirts by Van Heusen. Shoes by Bally. Waistline by Starbucks. He showed me the earthquake, the stock crash and the ferry disaster in his newspaper. “The news is so depressing. Start writing funny columns again. You’ll do more good than a hundred doctors,” he said. “You flatter me. You after my body?” I asked. “Eww, no thanks,” she said, wrinkling her nose. The flight attendant joined in. “Make us laugh,” she said. Being a sensitive person, I spent the rest of the flight deep in thought. Before hanging up my typewriter, I wrote literally thousands of humour columns for more than a dozen newspapers and magazines in Hong Kong and around Asia. We live in an incredibly amusing place. Only in Hong Kong is your security guard eight times older than your building. Only in Hong Kong are hideous concrete blocks given names like “Lush Verdant Garden”. Only in Hong Kong can a man sue another because he persuaded him to buy a 25th floor apartment on a building 21 storeys high. Only in Hong Kong does as car park space cost more than a car. And then I came to my senses. I decided I would write a column a day, but offer no guarantee that they would expand your blood vessels. They may give you one more smile than you’d otherwise have had. But columns don’t work unless they are partnerships between writers and readers. So here’s the deal. You send in the funny stories. I get the money. And when I advised you at the top of this column not to insert this newspaper into a blood vessel or any part of your body, I should have added that it should not be inserted into your columnists’ body, either. We are deeply sensitive people. Nury Vittachi is awaiting your funny stories so that he can steal them. Email him some! Wow, thanks for all the great responses to the Englasian piece posted yesterday. From Noreen, producer at Radio Television Hong Kong: “I read it today in the Standard and it was hilarious! Keep up your funniness!" From Henry Siu of Hong Kong: “I laughed when I read your piecel about ‘Chinglish’. I always find it amusing that my Hong Kong Chinese friends can speak English to on another and understand what they are saying, but when they speak with a "gwai-lo" or native english speakers, this is a completely different story. Here are some my observations as a Canadian-born-Chinese living in Hong Kong: I was wondering why "Hello Kitty" and her friends are so popular in Hong Kong? What's the deal? Also, how does "Hello Kitty" and "My Melody"communicate when they don’t have mouths? I am amazed at the multi-tasking ability of Hong Kong O.L. 's ("Office Ladies"). These are the ones who work in Central and wear black suit jackets, white shirts, black mini-skirts, black stockings, black high heels (even when it's 35 degrees outside!) and carry name brand hand bags and have all manner of things hanging from their mobile phone. How are these ladies about to walk faster than me up escalators (wearing high heels and mini-skirts), holding their shopping bags and hand bags, talking on their phones and using their octopus card at the same time."